MOSCOW, Russia (CNN) -- Russia's Foreign Ministry Tuesday threatened a "military-technological" response if the United States deploys a missile defense system in former Soviet-bloc nations near Russia's borders. 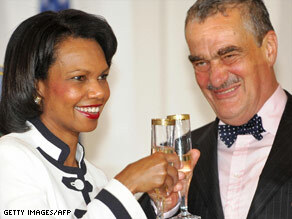 U.S. Secretary of State Condoleezza Rice and Czech Republic's Karel Schwarzenberg toast the deal Tuesday. The ministry issued the statement after U.S. Secretary of State Condoleezza Rice signed a deal Tuesday with her Czech counterpart, Karel Schwarzenberg, to place radar units for the system inside the borders of the Czech Republic. The United States is also seeking a deal with Warsaw to place interceptor missiles in Poland as part of the system. Rice cited possible nuclear threats from Iran as a reason for the program, which will go to the Czech Parliament for approval. But Russia reiterated its concerns that the U.S. program would threaten its security. "There is no doubt that the approachment of elements of the U.S. strategic arsenal to the Russian territory could be used to weaken the potential of our deterrent," the ministry said in a written statement. Russia has proposed a joint global missile defense system that would include Russia, the United States, Europe and others, but the United States has been cold to the idea. While en route to Prague, Rice told reporters that the United States wants the missile defense system to be "transparent" at all times to Russians. "We want them to have a way of absolutely seeing for themselves what we know to be true, which is that these systems are in no way aimed at Russia," she said. The program has been the subject of several back-and-forths between Russia and the United States. In April, former Russian President Vladimir Putin said he was encouraged by "confidence building" and "transparency" measures that the United States offered with respect to the program. But he said that technical experts must decide if those measures are enough. "There are certain questions on our agenda where we agree, and these are matters pertaining to Iran, North Korea," Medvedev said after the meeting. "But then certainly there are others with respect to European affairs and missile defense where we have differences." Pentagon spokesman Bryan Whitman said the United States has made it "very clear" that the purpose of the missile defense system will be to address "emerging" threats from the Middle East. On Tuesday, Rice supported those claims and said the program was likely to continue after Bush leaves office in January. "We've made the point to our Russian colleagues that we all face a threat from states like Iran that continue to pursue missiles of ever-longer range," she said. "It's hard for me to believe that an American president is not going to want to have the capability to defend our territory [and] the territory of our allies." Poland and the United States reached a tentative deal for the missile placement last week, but Rice and Polish Foreign Minister Radoslaw Sikorski, who was in Washington Monday, failed to finalize the agreement. "There are still some issues, so I can't say for certain what the trajectory is," she said on the plane to the Czech Republic. "But I think it was a constructive meeting yesterday." The Czech Republic and Poland are former Soviet satellites that are now members of the U.S.-led NATO alliance.